Pressure washer pump oil is an important component of your overall pressure washer maintenance requirements. This of course depends on which pressure washer model you own. Not all pressure washer pumps need oil. In fact most portable washers of the lower end such as cold water electric pressure washers of 1500psi, 1600 psi electric washers and some 2500 psi often come with low maintenance pumps. These are usually axial cam pumps that are sealed by the manufacturer and will not require any oil. This is done as a way to reduce the burden on the user in as far as continuous maintenance is concerned which when forgotten can lead to the pump and washer breaking down. This presents an advantage for axial cam pumps on electric cold water washers. The more demanding gas powered pressure washers such as those of 3000 psi and 4000 psi and above pressure output often come with triplex plunger more powerful pumps. These types of pumps demand ongoing maintenance and will require that the user time and again often within the first 50 hours of use check oil for top up or for total replacement after draining old oil out. Many manufacturers of pressure washers and pressure washer engines and pumps such CAT, Honda, Briggs and Stratton, BE pressure washers and others also produce oils to be used with their pressure washers. Even though it is advisable to get your brand specific pump oil in most cases many other pressure washer pump oil products on the market today are suitable for use with multiple washer brands. It is key to remember that pressure washer pump oil can not be used on pressure washer engines. When this is done it can lead to serious and expensive damage to a pressure washer unit. In considering which pressure washer pump oil to buy for your washer unit, first establish by referring to the owner's manual if your washer unit has need for pump oil. Most high quality pump oils for pressure washers are anti-wear and have a non-detergent formula. As an environmentally acceptable way of disposing changed oil, when you have drained your pressure washer oil out, is to dispose it at the nearest certified oil collection center. To avoid corrosion and damage of the pump, most pressure washer systems introduce detergents down stream. This means the detergent does not enter the pump but is introduced into the mix after water has already left the pump. Likewise in keeping with this principle good pressure washer pump oil products are made without detergent formula which can corrode your pump. Good pump oil for your washer should also be able to inhibit rust. This can happen as your pump is handling water all the time. Further, good pressure washer pump oil should be able to reduce friction which plays a role in pump wear as well as foaming. These types of pump oil are often pricey but will give you the best guarantee for longevity of your pump. The following are some pressure washer pump oil products to consider in your search for good pump oil for your washer. Selling for about $8.00 for a 21 ounce bottle online this pump oil is made for CAT pump pressure washers regardless of brand. There are a variety of pressure washers that run on CAT pumps. In fact CAT pumps are considered amongst the best for gas powered washers. It has certain superior properties expected of a good oil pump product such as anti-wear and non-detergent formula. 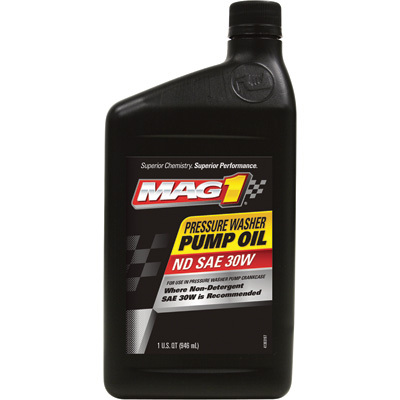 This oil will also aid your washer unit to run much cooler even when being used at higher pressure were there is greater demand on the engine and pump. You can safely and successfully apply this pressure washer pump oil to pressure washers not only with CAT pumps but also Comet, General, and AR pumps. This is a genuine pump oil product made in the United States. 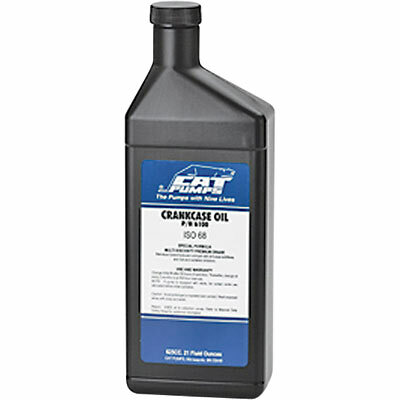 Selling at about $6.00 a bottle this oil is considered one of the best oil products for pressure washer pumps. It works on an entire range of different brand pressure washer pumps. This makes it a good alternative to the CAT pump oil reviewed above. This pump oil includes very good properties such as anti-oxidation, anti-rusting, and anti-foaming. It also protects your pressure washer from heat when working at higher RPM levels. Pressure washers owners have reported the pump oil working effectively to keep the temperature of their pump down. 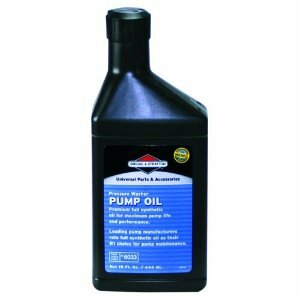 This pump oil has been used by owners of Workhorse and Northstar pressure washers with impressive results. It's been noted as a dependable and quality oil pump. it is genuine and made in the United States. 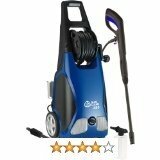 Comet pressure washers are highly rated high output pressure washers often with PSI figures of 4000 psi and 3600 psi. 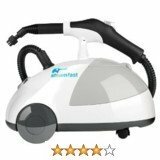 In the industry these are considered professional and commercial pressure washers of industrial cleaning capacity. Comet pressure washer pumps installed as replacements can also use this pump oil for best results in service. This pump oil is designed for higher pressure output washers. 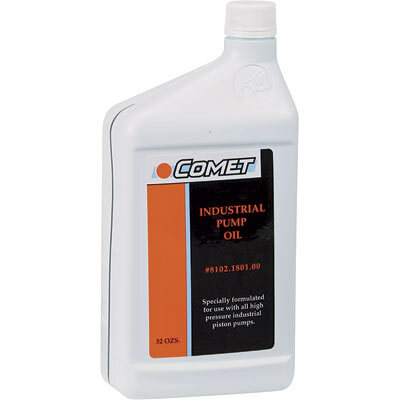 This Comet pump oil can be used on any high pressure output washer pump brand apart from Comet pumps. It has specially formulated properties for high pressure industrial piston pumps. This bottle of Comet pump oil sells for just $6.00 a fair price for the results guaranteed. This pump oil from Briggs is made with the different Briggs pumps in mind. It is however suitable to use on any brand of pump that might be in use on any pressure washer. This means this pump oil is designed also to work just as effectively on multiple pressure washer brands. It is a high endurance pump oil. It is worth noting here that this particular Briggs and Stratton oil is synthetic oil. This means the chemical compounds in the oil are synthesized or artificially made. This should pose no harm to your pump as high quality synthetic pump oil should be able to be mixed or used interchangeably with mineral oil. In fact there is a great movement away from mineral oil to use synthetic lubricants even for motor vehicles and some engines. This 15oz bottle sells for about $10.00 online.